Don’t miss this opportunity to acquire harder to find California wines with great age and impeccable provenance! Indulge in this delectable selection of single-owner Domaine de la Romanée-Conti and highly-rated, back-vintage Port! The first part of this collection, the Storyteller Cellar, had such a good turn out that we couldn’t help but offer a second part to this story! The stories this cellar could tell would fill a library! Assembled by a successful Texas gentleman, his vinous holdings were purchased on release from allocations of top California Cult mailing lists and the rest from reputable retailers in the Houston area. Collectors should not miss this opportunity to acquire highly-scored and sought-after wines from this cellar with impeccable provenance! Carefully selected and acquired by a collector over the last 30 years, this single-owner’s passion was to purchase wines directly from small producers and artisanal wineries, getting to really know the winemakers, their path to winemaking and their intention behind each of the wines. Collecting wine for nearly 20 years, the California aficionado grew his cellar immensely. Nearly all of his wine was acquired directly from his devoted membership to some of the Golden State’s finest wineries. Like a great melody, this collection is timeless, intriguing, and a bit opulent at times. This incredible collection of wines came from a collector who appreciated art in every form. Whether it be listening to the greatest symphonies or drinking the world’s most sought-after wines, each bottle was hand-picked for its grace and elegance. Located in the collector’s vacation home on California’s Central Coast, this large cache of rarities focuses largely on wines of Burgundy, Champagne and the Rhone Valley. A successful New England businessman, The Craftsman was equally passionate about the wines he collected and creating a breathtaking space to feature his treasures. Assembled by a successful Texas gentleman, this collection is a classic example of what many oenophiles create when they become serious about wine. 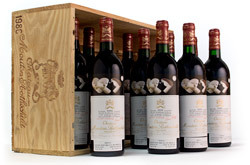 Assembled by a Los Angeles collector over the last 15 years, his goal was to purchase wines having a professional rating of 98 and above, most notably, “Parker Perfects.” Focusing on California and Bordeaux, the majority of the collection was acquired at the cellar door, with occasional purchases from top retailers throughout the US.